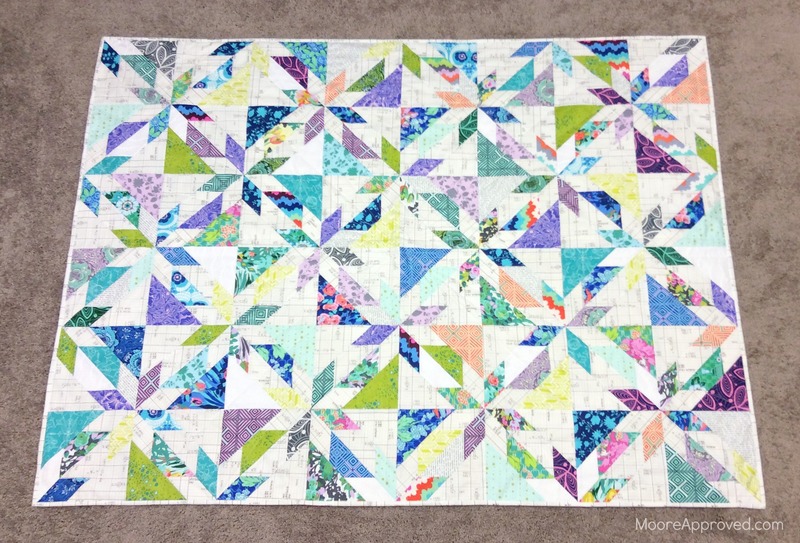 According to the post where I first started working on the Scrappy Hunter’s Star quilt, this project starting rolling back in July. This has been a work “in progress” since then. While I originally planned to make 80 blocks, 62 ended up being made – with some of them not being large enough. 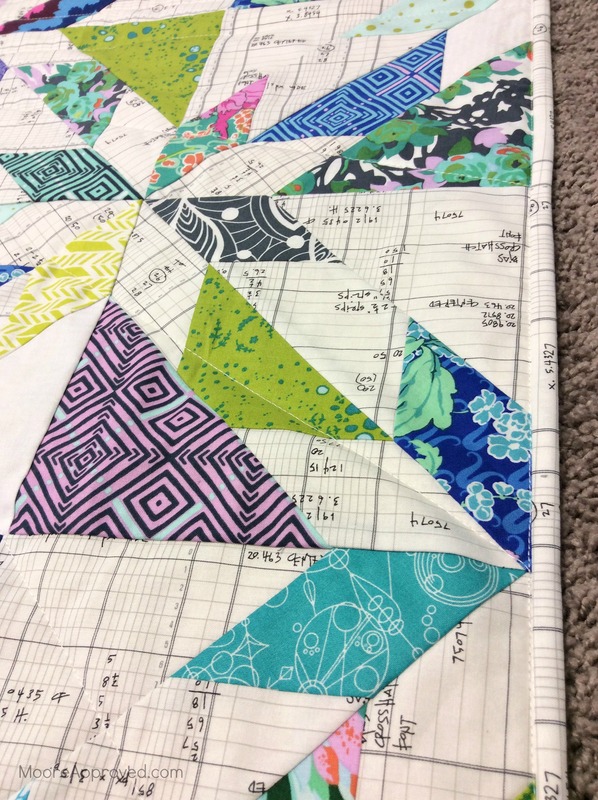 The blocks are supposed to be 8 1/2 inches (8 inches finished). I selected the 48 blocks I liked the most, arranging them in eight rows of six. 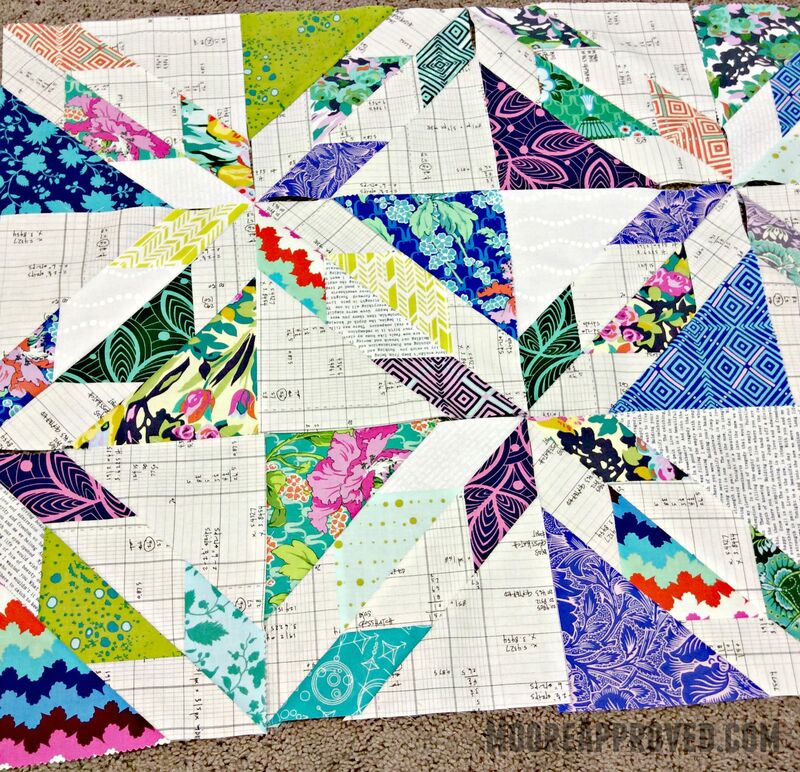 To make the blocks, I followed the Scrappy Hunter’s Star Tutorial from the Hopeful Homemaker. It is Layer Cake friendly, but I also cut 10 inch squares for my background fabric – a white and black grid print from Carolyn Friedlander’s Architextures line. The more colorful prints are a mixture of Amy Butler Violette, Alison Glass Sun Print, and a pink and purple Kaffe Fassett. During piecing, I was rather meticulous about glue basting every seam with Elmer’s Washable School Glue. I believe this vastly improved my points matching up and accuracy. Another factor was that I squared up each block using a Creative Grids 8 1/2 inch Square It Up and Fussy Cut ruler. (AFFILIATE LINK) Believe me, it was $25 well spent! My blocks went together so easily. Following Christy Fincher’s Spinning Seams method also made a difference in how flat my seams ended up. With all of my previous quilts and a couple handmade bags – random spots, iron scorch marks, and tiny stains somehow wind up on the fabric throughout the making process. THIS DRIVES ME CRAZY! Then I’d have to apply stain remover and wait and see if the spots would disappear in the washing machine. 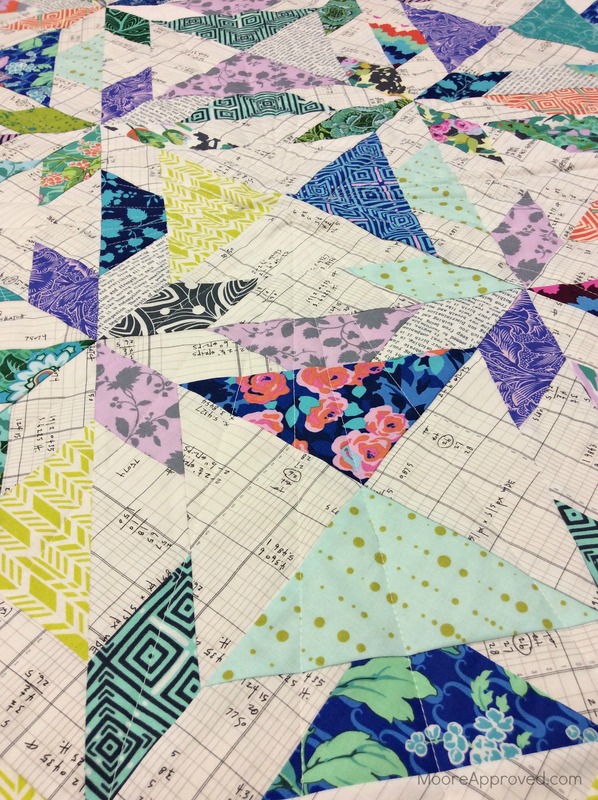 I was worried about this quilt, especially since a large portion of it is white. Heck, I rarely wear white clothing because I constantly worry about it getting something spilled on it. Ordered a couple cans of fabric Scotchgard off Amazon (checked around – the prices were about the same or better than retail stores), and sprayed two moderate coats on the completed quilt top, backing fabric, and binding fabric – before cutting into 2 1/2 inch strips. (AFFILIATE LINK) After spraying each piece of fabric, I let it dry for about one hour before picking it up. Well, what do you know – IT WORKED! For the equivalent of using $2-$3 worth of Scotchgard, I haven’t noticed any mystery spots or stains. I wondered if pressing the fabric after applying the Scotchgard would “lessen” its effectiveness, but the heat didn’t appear to negate the application. I did take a scrap of the binding fabric with Scotchgard on it and ran it under water. At first the drops did bead off, with water eventually soaking into the material. 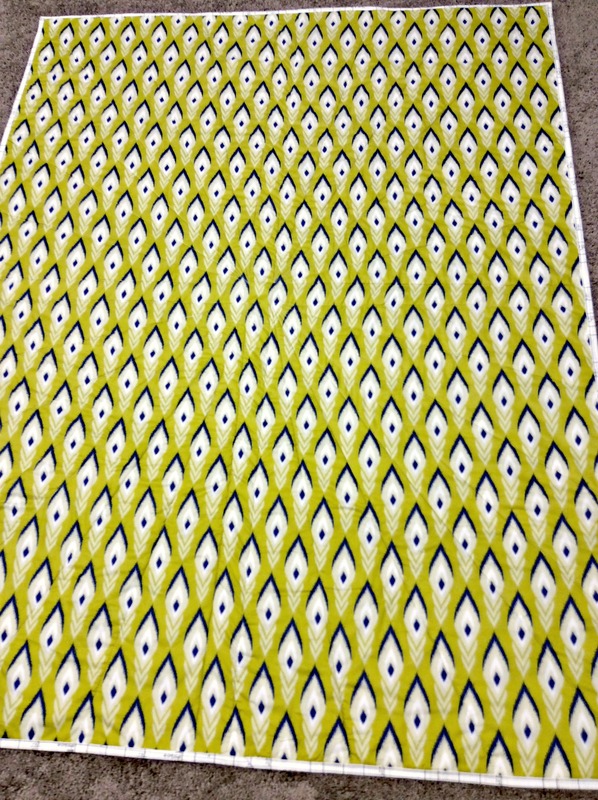 I’m so going to Scotchgard every single project I make from now on that incorporates light or white fabric. The backing is a single piece of Heather Bailey for Free Spirit called Flight Voile in Gold from the Momentum collection. 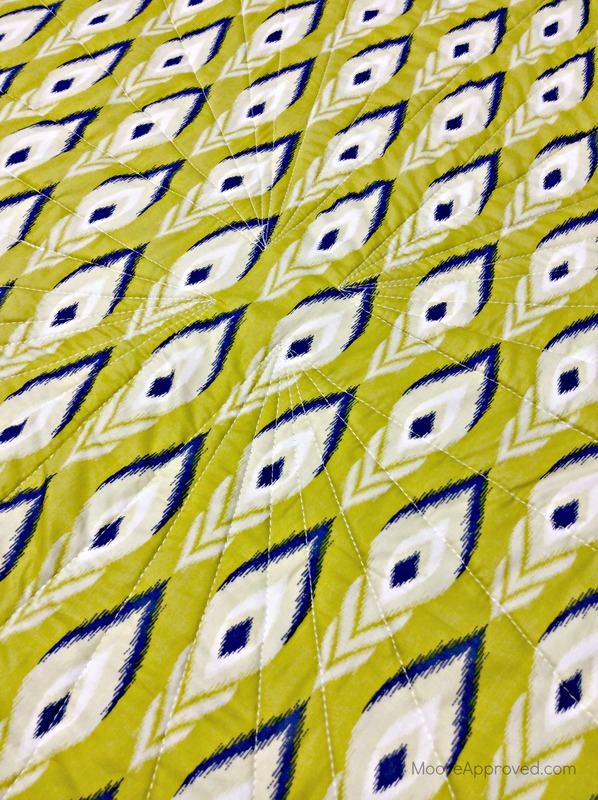 When I met Anna Maria Horner, she recommended using voile as a quilt backing – since the Free Spirit line has a 54 inch width. Took that advice, and am so happy that I did. Free Spirit’s voile is extremely soft, lightweight, and very easy to press. 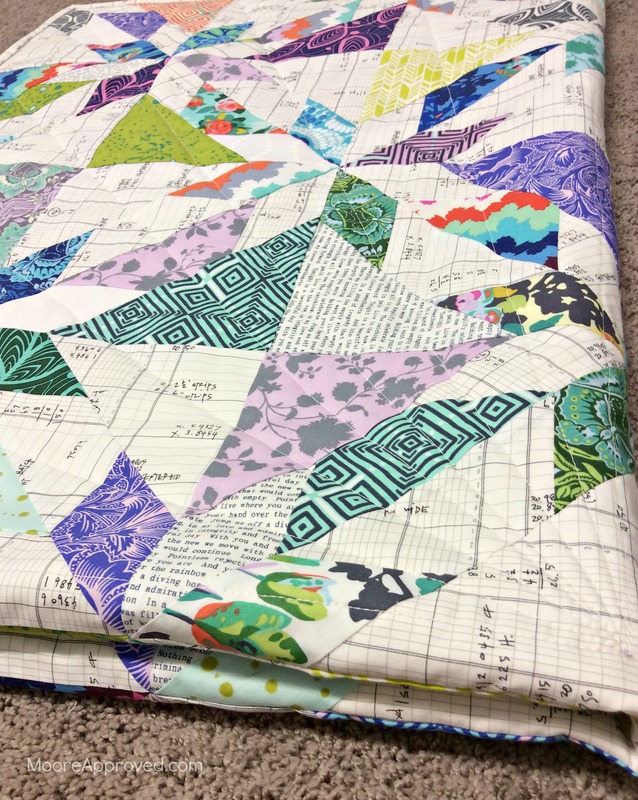 For any quilt top under 50 inches or so wide – I will definitely use voile again. Because I’m a busy gal, I chose to machine bind the front and back using Clover Wonder Clips and by stitching in the ditch on the front to “catch” the binding to the back of the quilt. It’s not perfect, but it’s worth it to save the time I would have spent hand binding. Scrappy Hunter’s Star is definitely an example of how far I’ve come with sewing and quilting in the three years I’ve been on this journey. In other news – we got an espresso machine! 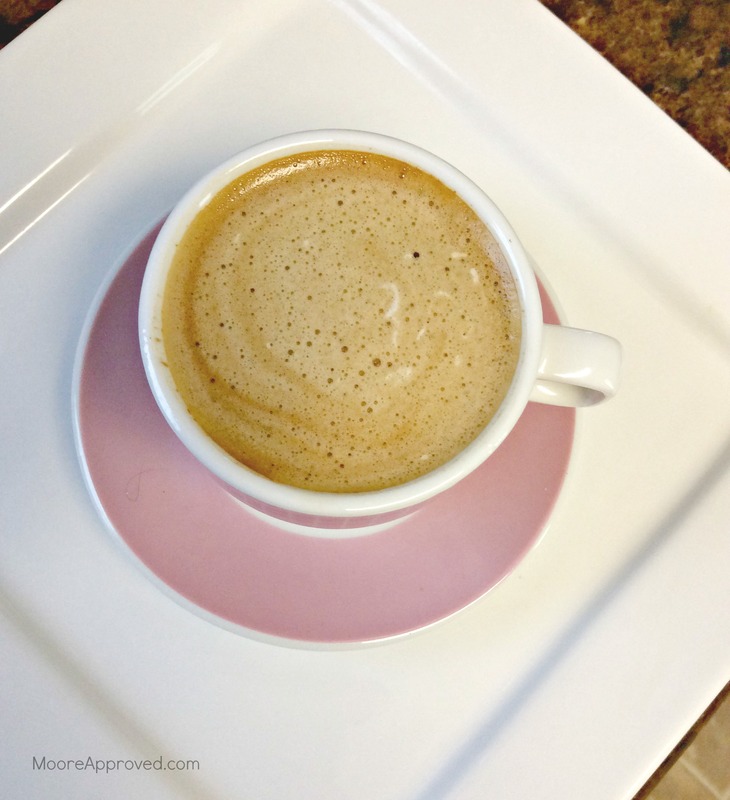 Making espresso is more time consuming and labor intensive than regular ‘ol coffee. But it is SO worth it!!! The energy boost I get from espresso is absolutely insane. Normally, I feel rather sluggish in the afternoons. Not with this stuff! I can go all day long feeling alert and energetic thanks to a cute little cup of it. How is your New Year going so far? Please share projects you’re working on with me below in the comments! Moore Approved is a participant in the Amazon Services LLC Associates Program, an affiliate advertising program designed to provide a means for sites to earn advertising fees by advertising and linking to Amazon.com and partner websites. 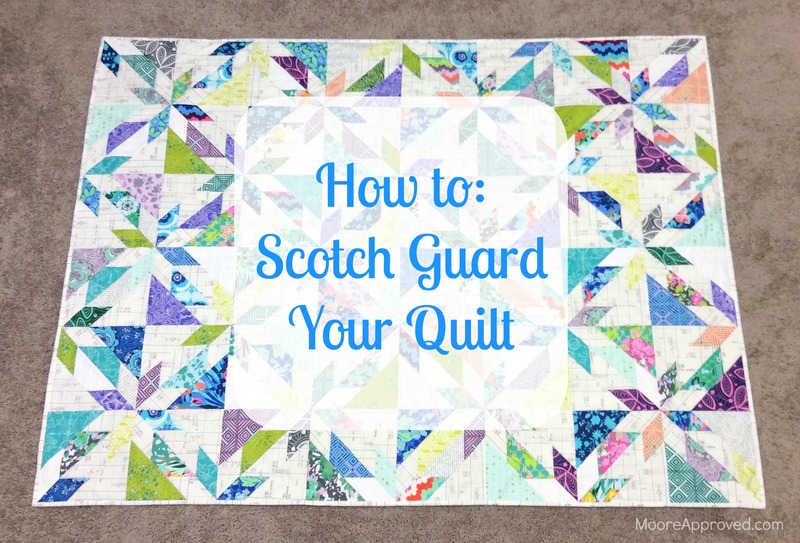 One Response to "Quilting Tips: Scotchgard Your Fabric, Marking Quilt Lines, Spinning Seams"
I would never have thought of using Scotch Guard on a quilt, but it certainly seems to have worked for you! Congratulations on conquering a tricky patter–Hunter’s Star is not easy. Beautiful result.